This log cabin building is one of the park model RVs from Green River Log Cabins. This Top-line Series (Better) cabin has one bedroom and one bathroom with 399 square feet of space. The bedroom has a queen sized bed base that is built into the room, and a living room with an electric fireplace. There is a full bathroom with shower, and space for a stackable washer and dryer. The Top Line Series (Better) log cabin has a full-size kitchen. The Top-line Series is beautifully designed with wood throughout from the floors, walls, ceiling, kitchen and bathroom cabinets. The kitchen also has a bar countertop that you can sit at and enjoy your meals, or sit when friends come over. This log cabin design has an upstairs loft for sleeping or use as a rec room. The log cabin in the photos has a covered front porch, and a side covered patio. 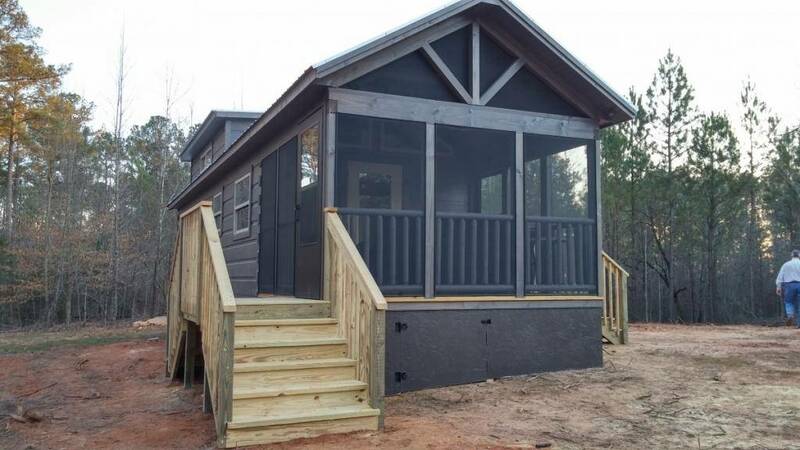 The Top-line Series is an affordable log cabin option to get the vacation home or log cabin design you've been dreaming. Green River Log Cabins is located in Campobello, South Carolina. Green River Log cabins have a variety of log cabin park model RVs, and modular log cabin designs to choose from. 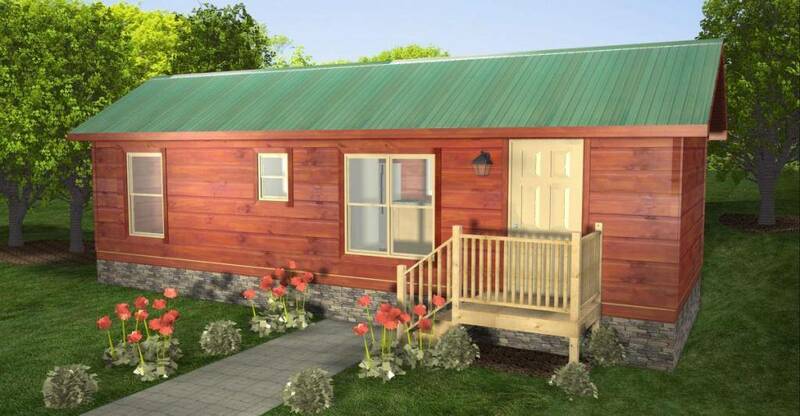 The Top-line Series is a beautiful log cabin design, for all your small house living needs. This log cabin has 399 square feet of space, with one bedroom, a living room, kitchen/dining and bathroom with tub. The top-line series of cabins are part of the park model RVs from Green River Log Cabins. This log cabin is beautifully finished with wood throughout from the floors, walls, ceiling, storage kitchen and bathroom cabinets. The tiny cabin has a peaked roof, so the cabin feels spacious and has plenty of windows to fill the cabin with natural light. This cabin would make the perfect summer home for a small family or a couple. The top-line series of cabins is a great option when you are looking for a cabin space for use with family and friends, to make memories that will last a lifetime. The Top-line Series (Good) is a tiny house cabin built by Green River Log Cabins. This is just one of the cabins available from Green River Log Cabins. Green River Log Cabins has a variety of log cabins available from modular designs, to park model RV's. They are located in Campobello, South Carolina. Tiny Mobile Sauna as a Weekend Getaway - Why Not? 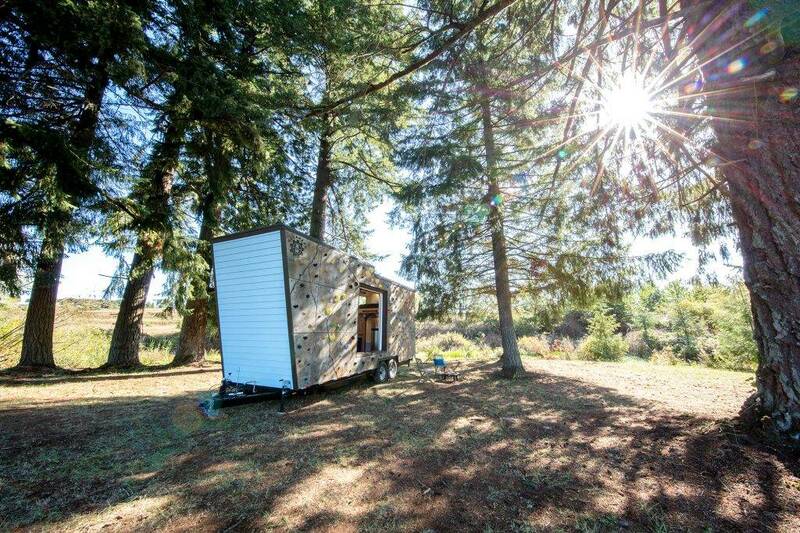 The Flying Sonnet is a unique tiny house on wheels originally built as a mobile sauna and repurposed into this gypsy wagon in the North Carolina mountains. The Flying Sonnet gypsy wagon is 10 feet long, 8.5 feet wide and 9 feet high. 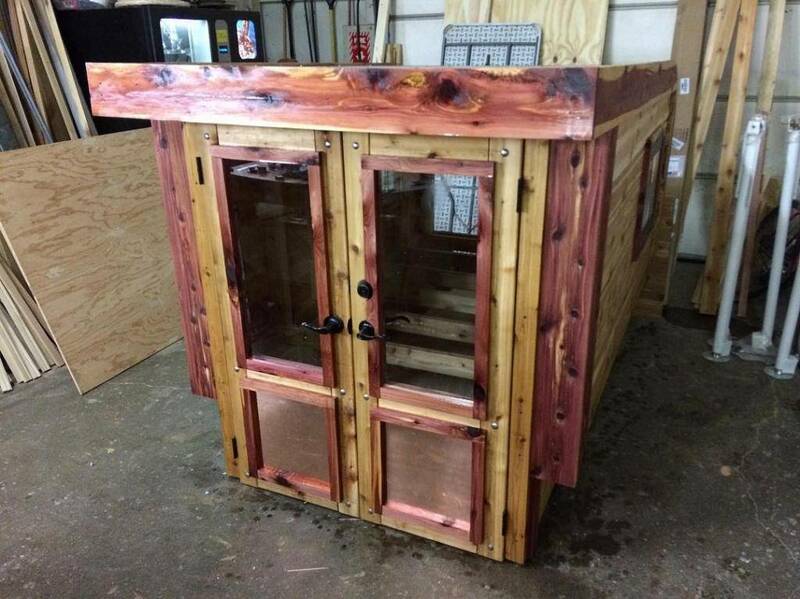 The exterior of the tiny house design is built with Eastern Red Cedar tongue and groove. There is a wood stove in this tiny space that also doubles as a sauna water heater when needed. Over the shallow porch are red stain glass windows that add character to this tiny house design. Inside there is a bed loft that has a shifting section that turns the bed into a two-level bench. Simple in design, the Flying Sonnet is the perfect tiny house space for sleepovers and a nice getaway. 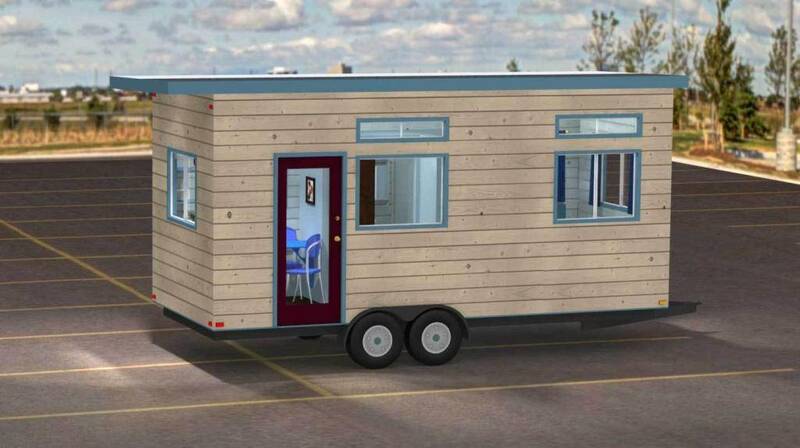 The Flying Sonnet is just one of the tiny house designs you will find from Carpenter Owl. 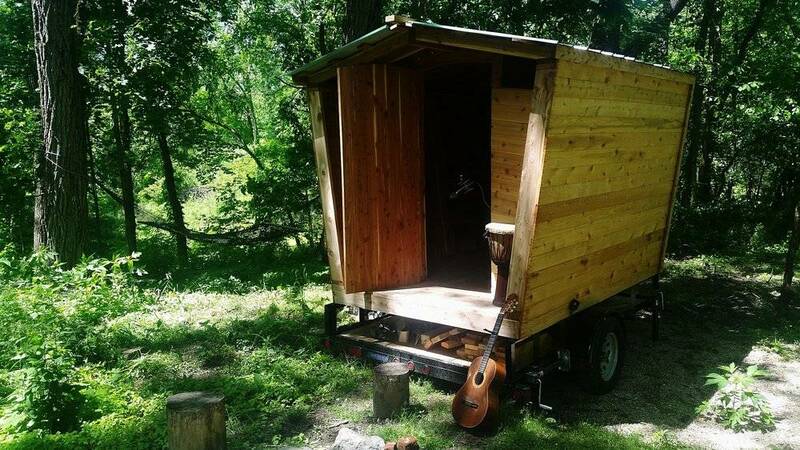 Their studio is located in Bloomington, Indiana, and they build tiny homes, studios and excursion structures. They specialize in building structures from natural building materials and try to build tiny house designs that are low in chemicals and free of allergens. They also like to use reclaimed and locally sourced building materials wherever they can. The Silverado Slider is a custom built wooden camper slider made for a Silverado pick up truck. The Silverado custom camper slider is 8 feet long, 5.5 feet side and 4.5 feet high. The camper slider has a curved metal roof that has a flush mount solar panel that feeds a battery pack that is in the storage cabinet of the camper. The camper slider has an extendable awning. The Silverado camper slider has framing that is lap-jointed and bolted Western Cedar. All of the lights in this custom camper are LED and are in a variety of fun colors. This custom wooden camper was used for a 10,000-mile travel adventure. The Silverado Slider is an excursion structure from Carpenter Owl. The Carpenter Owl studio is located in Bloomington, Indiana. The tiny house builders have a variety of tiny house designs available to include tiny homes, studios and excursion structures. They specialize in building unique structures from natural building materials. They try and build structures that are free of chemicals and allergens, and use reclaimed and locally sourced building materials whenever possible. Carpenter Owl also has a diy program for people to help build their tiny house designs from concept to finish. The Gypsy Tug is a tiny house design like no other. The tiny house structure is currently located on an educational farm but was originally built to be part of the Cafe Junkit collective, which is a project that takes homemade boats down the Mississippi River and stops in riverside towns to put on shows and to also serve pumpkin pie. The tiny structure has cedar shakes around the door that is layered up to provide depth. The tiny structure Gypsy Tug is 8 feet by 8 feet and 9 feet high. Some of the unique features of this special tiny house include the polycarbonate windows that run down the sides of the tiny house, the curved side walls that make backing up a bit easier, and the fact that this tiny home was designed for both land and sea use. The tiny house has a nice sleeping space surrounded by windows to enjoy the view. Underneath the bed is plenty of storage for your stay. This lovely space is one of a kind and has an interesting story to tell. The Gypsy Tug is one of the excursion structures built by Carpenter Owl. The Carpenter Owl studio is located in Bloomington, Indiana. Carpenter Owl builds a variety of tiny house designs from tiny homes, studios and excursion structures. Hale's Potting Studio started as a potting shed and just kept growing and is now used as an outdoor bedroom. Hale's Potting Studio is 10 feet by 10 feet and 17 feet high. The tiny studio is in a lovely location next to the garden. The ramp that leads into the tiny studio is made of scrap limestone blocks and lime dust. There is a back porch that is cantilevered from the roof rafters to remove the need for any columns. The ceiling in this studio design features a polycarbonate skylight to bring in diffused north light into the space. This tiny studio feels spacious thanks to the high ceilings which also let in lovely natural light. You could use this tiny studio for a variety of uses to include potting shed, pottery studio, outdoor bedroom, artist studio, backyard office and guest room to name a few. Hale's Potting Studio is a tiny studio design built by Carpenter Owl. The Carpenter Owl studio is located in Bloomington, Indiana. 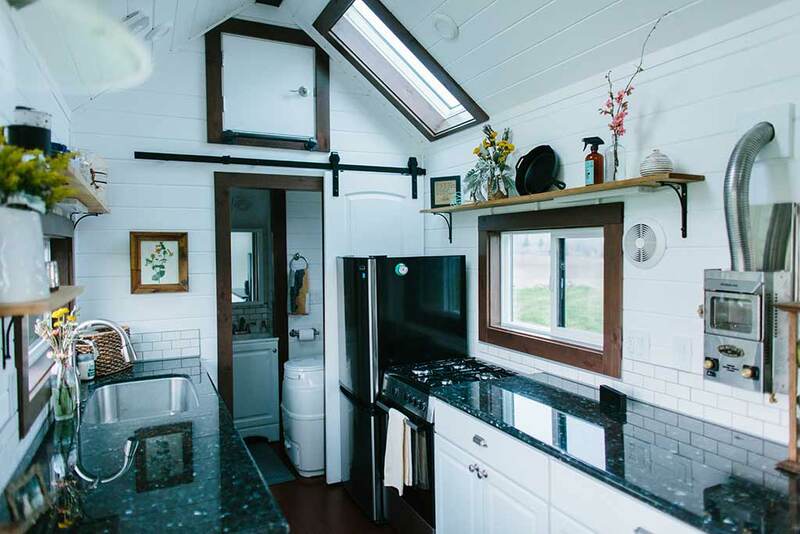 These tiny house builders believe in designing spaces that are chemical and allergen free. They use reclaimed building materials whenever possible. Carpenter Owl also has a diy program where clients can help build their tiny house design from concept to finish. 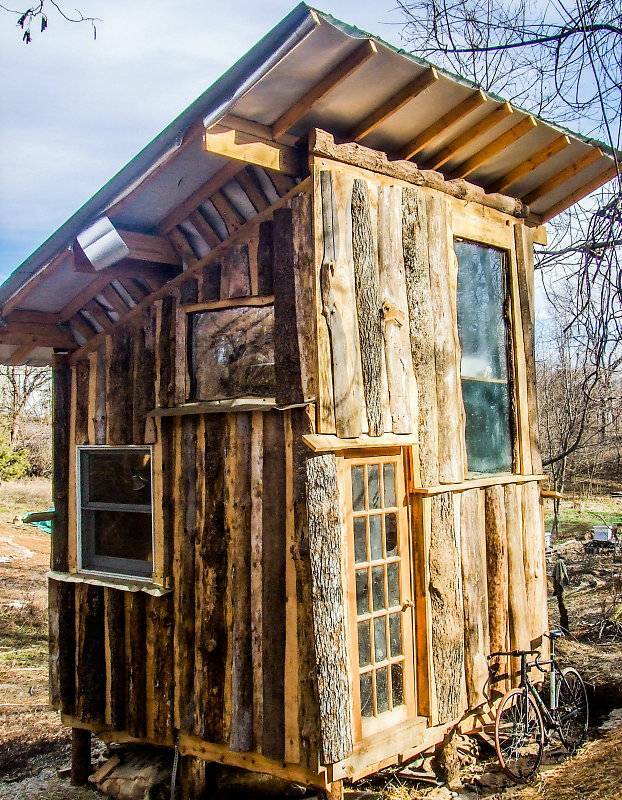 The Shackteau is a tiny rustic house that is 8 feet by 8 feet and 19 feet high. The lumber used for this tiny house is left over slabs from the milling done on a family piece of land in Southern, Indiana. The interior walls of the space are a combination of earth plaster and stucco. The front deck of the Shackteau is four feet wide roughly sawn slabs of Red Oak. The insulation for this tiny house is basic loose straw infill, that is supported on the bottom by burlap. This tiny house fits in perfect with its forest location, and is a nice space to getaway, play some music or read a book. The Shackteau is a good example of a tiny house design that uses recycled and reclaimed building materials and makes a fun space without having to spend a whole lot of money. The Dr. Suess chimney was added and then removed by one of the residents of the tiny house space. The Shackteau tiny house design is from Carpenter Owl builders. The Carpenter Owl Studio is located in Bloomington, Indiana. The tiny house builders believe in building homes that are free of chemicals and allergens, and try to use reclaimed and locally sourced building materials whenever possible. The Cozy Rosie is a saltbox style tiny house design that was built to be a simple, compact design for one person to live comfortably. 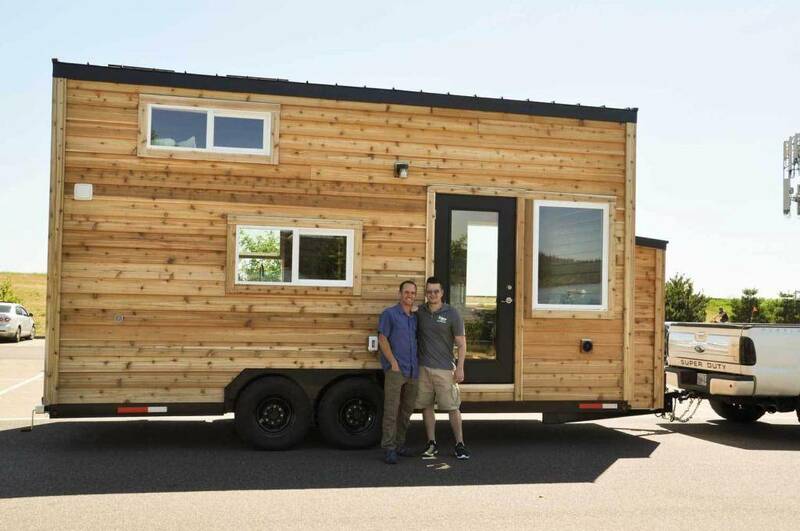 The tiny house on wheels is 12 feet long by 8.5 feet wide, and 13.5 feet in height. The exterior of the Cozy Rosie uses Easter Cedar with Western Cedar trim. The Cozy Rosie has a passive solar orientation so you can move it depending on the season. The roof has a clear, north facing skylight that runs the width of the home. The kitchen counter has a hidden tiny fridge and a 20-gallon electric water heater. The shower in this tiny house design was made out of galvanized steel roofing that sheds into a 32 inch by 32-inch fiberglass basin. The pipes are all soldered copper with simple valves. The upstairs loft has room enough for a queen sized mattress and has a sky light that runs its entire length. There is also a second, smaller loft that is located opposite the lofted bed. The staircase in this tiny house design uses seven hardwoods that are native to Indiana to include poplar, walnut, hickory, maple, cherry, red and white oak. 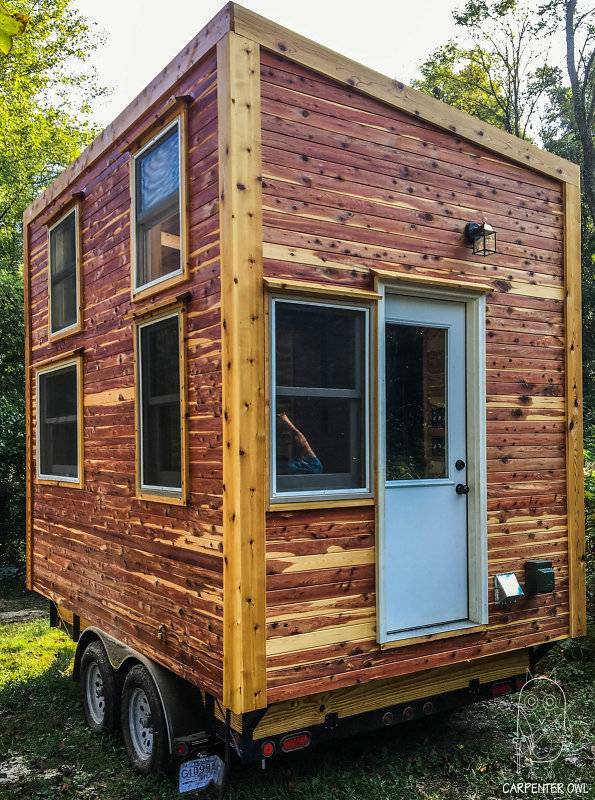 Cozy Rosie is a tiny house on wheels built by Carpenter Owl. The Carpenter Owl studio is located in Bloomington, Indiana. These tiny house builders believe in creating tiny house environments that are low in chemicals and allergens. They try and use reclaimed and locally sourced building materials whenever possible. Carpenter Owl also offers diy programs that help the clients be involved in the building process from concept to finish. 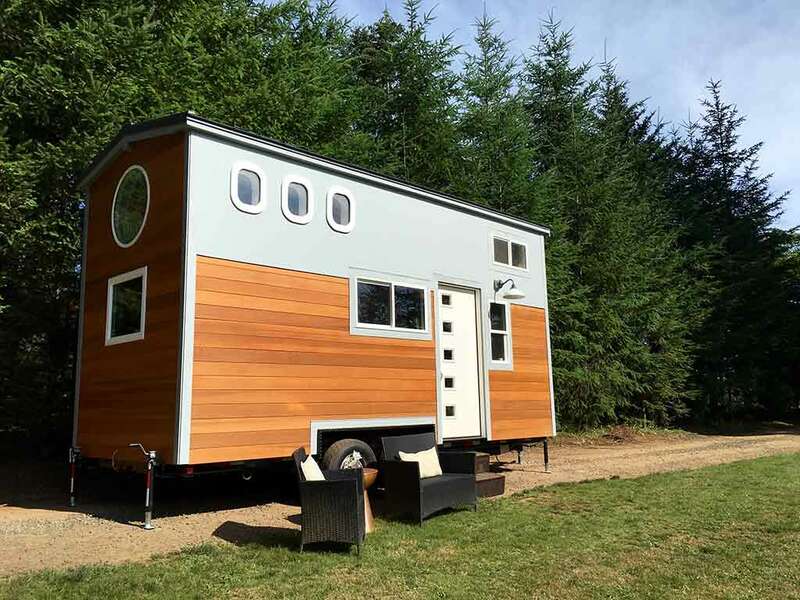 The Wooly Resistance tiny house on wheels is a 150 square foot custom tiny house design. The whimsical, tiny house design was built as part of Carpenter Owl's DIY program, which is a program where the owner helps from concept to finish in the tiny house build. The exterior tiny house design was sided in Eastern Juniper and is trimmed in Western Cedar. The north wall and the ceiling are an assortment of Indiana hardwoods. The Wooly Resistance is built from natural wood, tung oil and sheep's wool to help create an environment that is free of chemicals and allergens. The entry door for the Wooly Resistance is on the second floor to help minimize the number of stairs that were needed inside the tiny home to access the four levels. You enter the tiny home through the cuddle loft which is a space for living, working, dancing, relaxing and cuddling. The stained glass in the living space is made by a company in Kokomo, Indiana. A walnut staircase takes you into the kitchen with access to a sleeping pod. Wooly Resistance is a tiny house design from Carpenter Owl. The Carpenter Owl studio is located in Bloomington, Indiana. Their tiny house designs are equipped to be used year round, as full-time residences and can either be built as tiny houses on wheels or permanent foundations. Honey on the Rock is full of unique beautifully crafted details throughout its tiny house design. The lovely exterior is all walnut and cedar trim. The roof of the Honey on the Rock is made from reclaimed structures that were rolled flat. 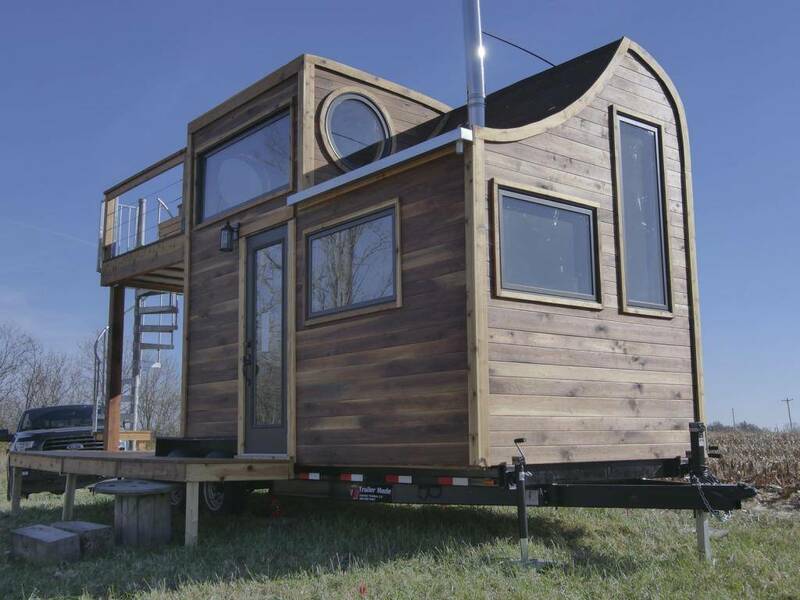 The tiny house on wheels has a double patio with a spiral staircase to the upper deck. The table on the upper deck of the tiny house design folds down to reveal a vintage soaker tub. The light fixtures in the tiny house design were all hand cut from wood. There is a secret door that is behind a drawing that leads from the upstairs loft to the outdoor soaker tub. The bed is kingsize and has his and her porthole windows on the sides and an operable window at the head. All of the plumbing in the tiny house design was done with soldered copper. The shower uses elastic stucco with a slate shelf, and a floor with a hand laid spiral mosaic. Honey on the Rock is a tiny house design from Carpenter Owl. Carpenter Owl is a building studio that specializes in creating unique structures from natural building materials. They build homes that are low in chemicals and allergens. They try and use reclaimed and locally sourced building materials wherever they can. Tiny homes are a labour of love, and this tiny house on wheels definitely showcases that beautifully. 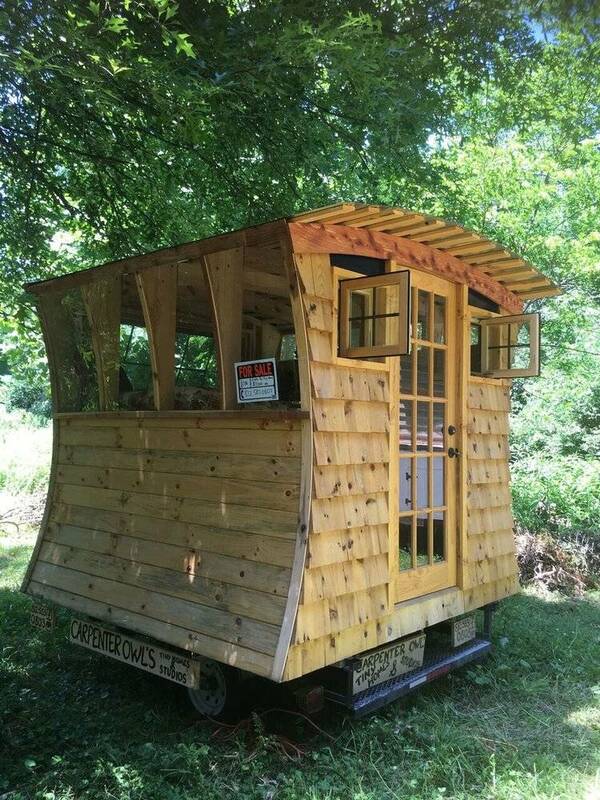 A rustic, artistic approach to tiny house building can be seen with the charming Snails Away tiny house on wheels built by Daniel Weddle of Carpenter Owl. It's small house designs like this one that really makes tiny house building seem approachable even for those who don't have extensive carpentry skills or qualifications. 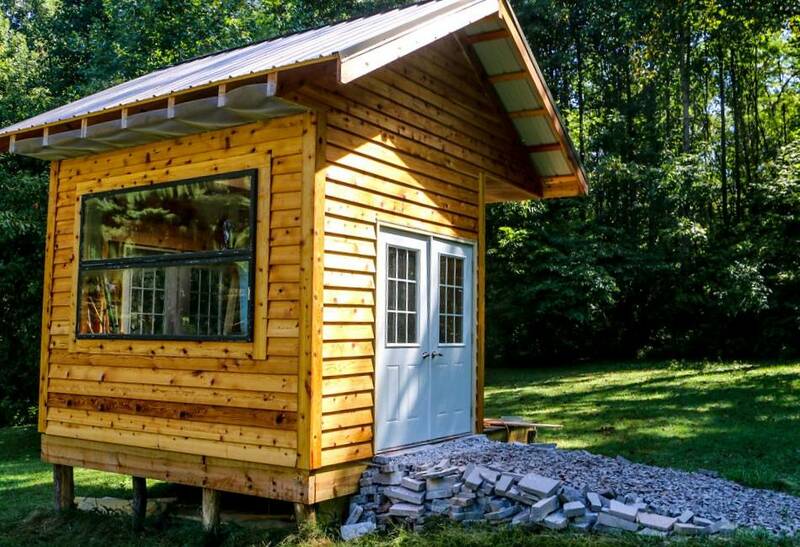 For the most part, this tiny house was created out of reclaimed and recycled materials, which is a fabulous way to build a tiny house on a budget. You can see that the builder used a variety of brilliant woods to create the exterior siding for the home. In this case, mainly cherry, maple, and poplar woods were used, and that wood came from trees that had already either been blown over in the wind or that had died of natural causes. It's wonderful to see the mosaic patchwork of the different colours and types of wood brought together on the outside of the home, creating a personality of its own. 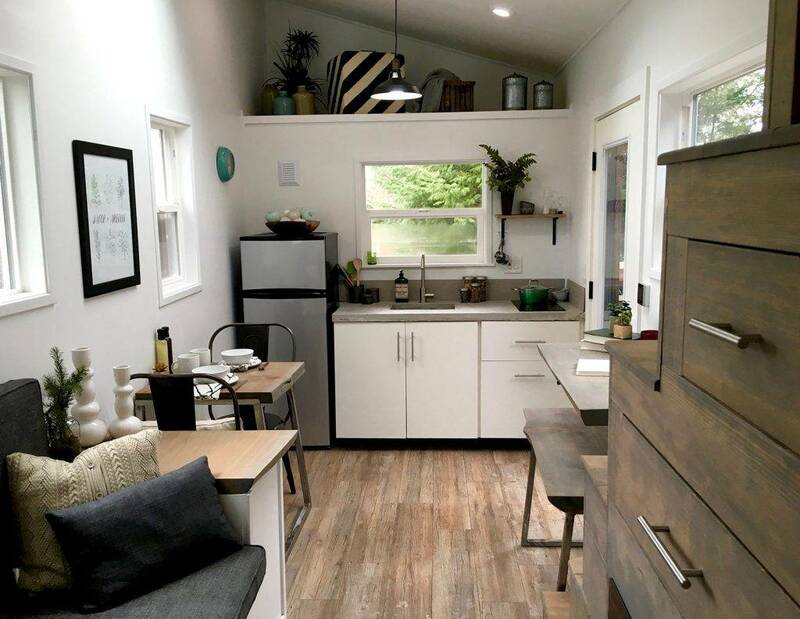 You'll also notice the many windows that line the walls of the tiny house on wheels, which also seem to be upcycled and repurposed to create a lot of openings in the home. Even the wooden door has a glass panel in it which is perfect for bringing more light into the home. Inside this charming home, you can see what a difference having all of these windows makes, bringing light into the home and making it feel more expansive. If you ever thought a tiny house was too small to host your friends for a night of jamming, think again, Snails away also proves that no home is too small for a gathering. A minimalist approach to small house living is what the Zen Den is all about. Clean lines and minimal design concepts create a tiny house that is worthy of some praise. 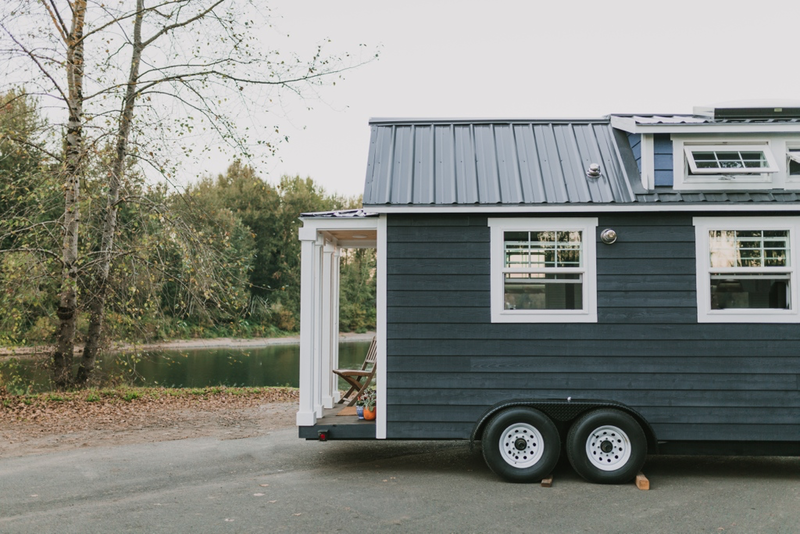 On the outside, the tiny house on wheels looks stylish and contemporary with the sleek slate grey metal and natural wooden siding. Who can miss the unique and stylish round windows on this tiny house either? The bottom window is a portal into the living room area of the tiny house, and it also offers unobstructed views of the surrounding scenery acting as a portal to the outside world. Since the tiny house is on wheels, it could be parked anywhere so that the guest or owner could have some zen anytime they needed it. Inside, this tiny house design features more of what you see on the exterior of the home. Clean and fresh design and a multitude of sophisticated features like the fireplace on the wall. There is also a kitchenette with a small fridge and a microwave for minimal cooking. A ladder close by leads up into the loft and there is also a rooftop patio for endless nights of stargazing and relaxing days of reading or sunbathing. The philosophy of this tiny house is to let go and unwind which is very possible in such a calming and purposeful space such as this. 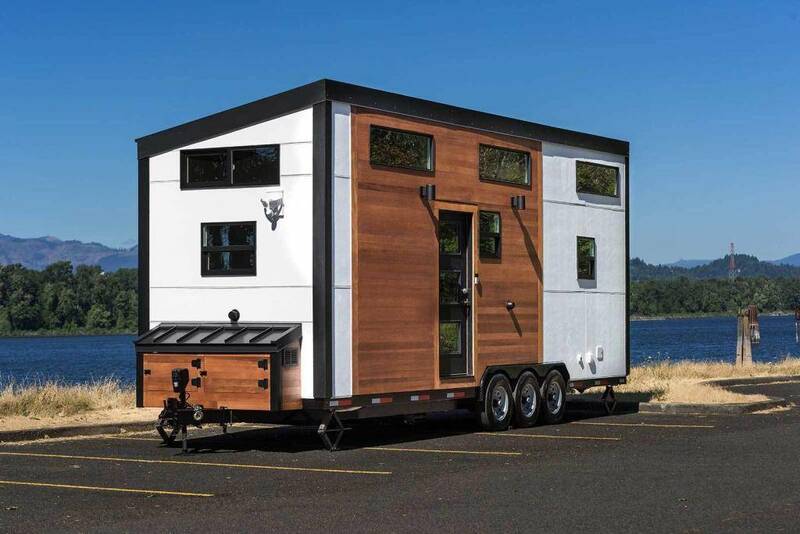 Since it's so lightweight, this tiny house can be moved around easily by a pickup truck or another vehicle with suitable towing capacity. That means people can take their Zen Den on the go wherever they want to experience some relaxation in their home away from home. 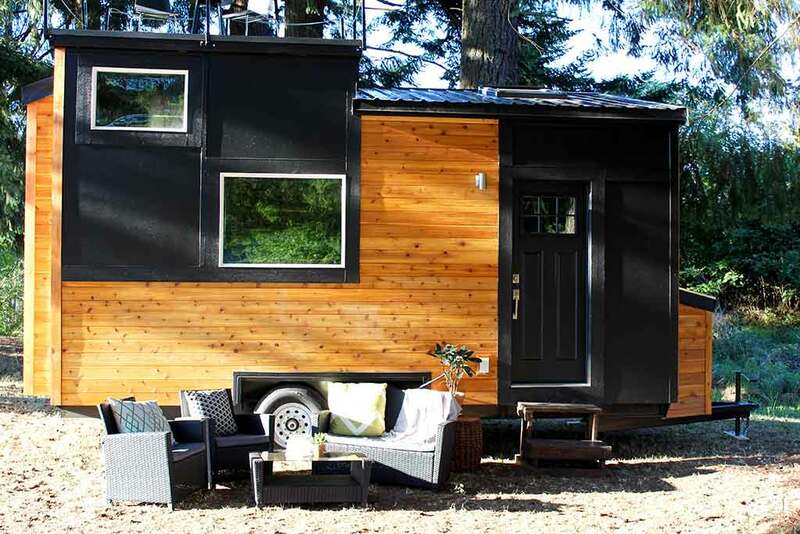 Modern, sophisticated and stylish are just some of the highlights of this tiny house design. With an outstanding exterior and a polished interior, you may even consider small house living for yourself. The Amelia features a very unique design that combines different elements of decor. On the exterior, you'll notice the mix of board and batton with wood siding and the interesting pavilion-style rooftop with different levels. This offers a lot of ceiling height within the home and makes for a very interesting looking tiny house on the outside. The home enters in through glass double doors which offer great views when they are both opened or closed. The deck built on the home is also a great feature which most people enjoy having which can be used as an extension of the home's inner space. The double doors lead into the kitchen which is fully equipped with all of the latest luxury stainless steel appliances. A gas range, a tiny fridge, a small sink and, of course, a coffee maker. Beside the kitchen is a seating area complete with two slipper chairs and a fireplace to cozy up to with a TV mounted over top for all entertainment needs. The bathroom is adorned with glossy white subway tiles and an intricate ornate tile that complement each other perfectly. One of the notable features of this tiny house design is that the bedroom is located on the main floor of the small home which is great for accessibility and ease of movement through the home's floor plan. The Amelia shows that you don't have to give up class and luxury in exchange for small house living and that the two can coexist perfectly well together. With small home design, you may think that there are only so many ways to arrange the layout of a tiny house on wheels. The cheery Cheeky Monkey home called the Strawberry shows us yet another innovative tiny house design innovation that is different from the rest. So what makes this tiny house so unique? 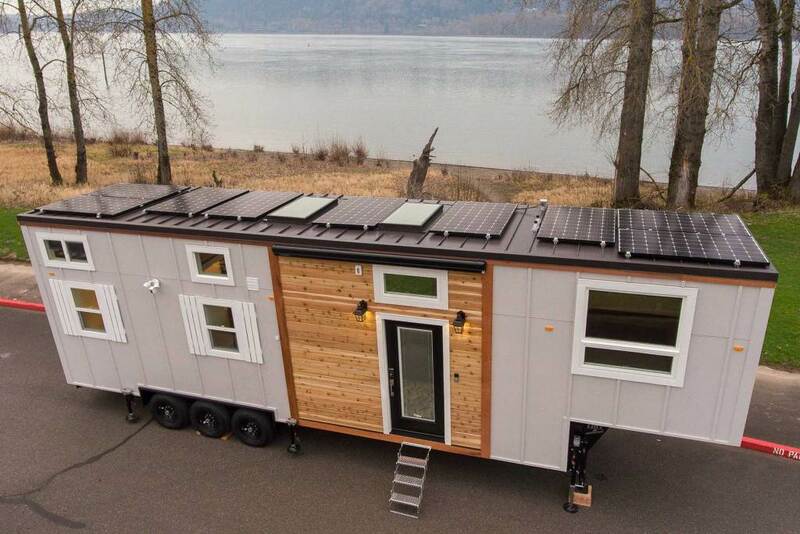 Unlike most tiny houses, this tiny house on wheels features a bathroom at the centre of the floor plan. 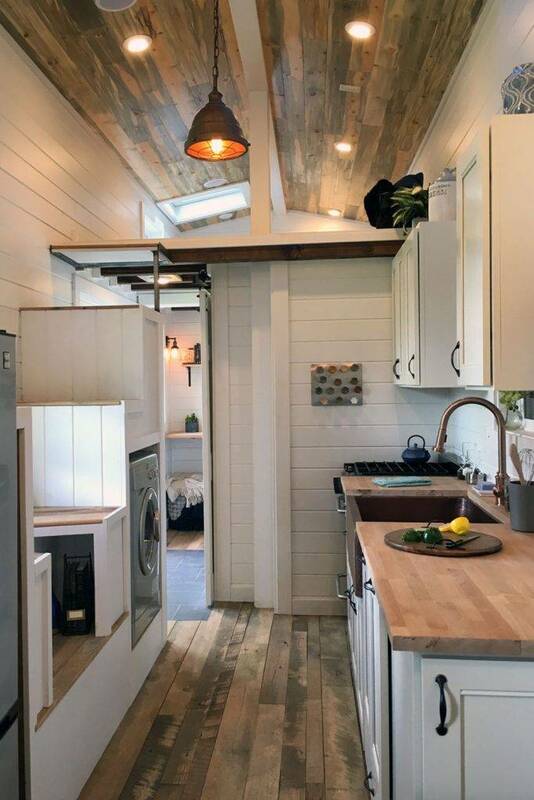 While most tiny house bathrooms are situated either in the front or the back of the home, this one is smack dab in the middle with a loft space overhead. Since the loft is smaller, it could be great for storage, and the bedroom is located on the main floor. 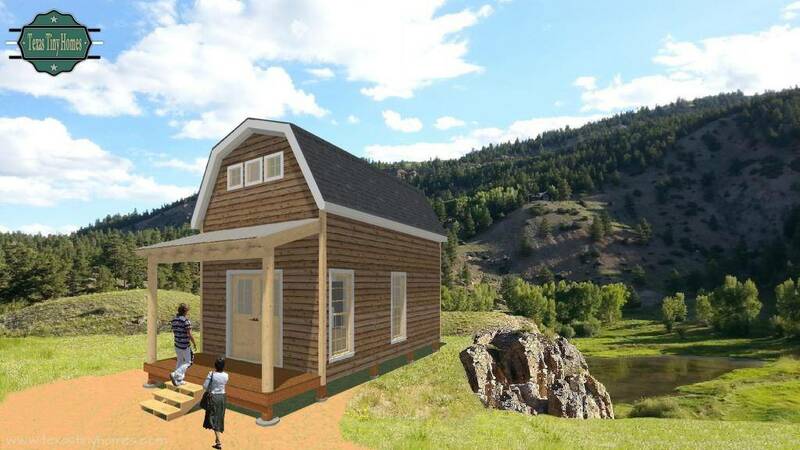 You can see in the renderings of this small house design that the bedroom takes up one end of the tiny house while the kitchen and living room area occupy the other end with the bathroom separating them. Behind the bathroom, there also appears to be some storage space as well which could be perfect for hanging up clothing or storing outdoor gear. The L-shaped kitchen leaves enough space to host a small sofa to the side, or it could also be used as a space to put a dining table. The home is 28 feet long which is why they were able to pack so much into the space. The renderings make it easier to visualize what the floor plan will look like when the home is completed, bringing life to the initial ideas. A great view of things to come, the Cheeky Monkey Jude model shows what one of the tiny houses from Cheeky Monkey Tiny House could look like. These are excellent ideas for a very comfortable tiny house on wheels. The home is a total of 28 feet long allowing for plenty of room to play around within the design. Like other models from the company, this one also features a bathroom in the centre of the home which creates a very different floor plan than most small house designs. Because they place the bedroom on the main floor, the bathroom creates an excellent separation between the kitchen area and the bedroom. Also, above the bathroom area is another sleeping area which could also be used as storage space depending on what the dwellers need. Stairs lead up to the loft area providing a safer and easier way to access the loft with the potential of more storage being able to go within the stair frame. The shed roof also gives more space within the home providing higher ceilings and more overhead space up in the loft. 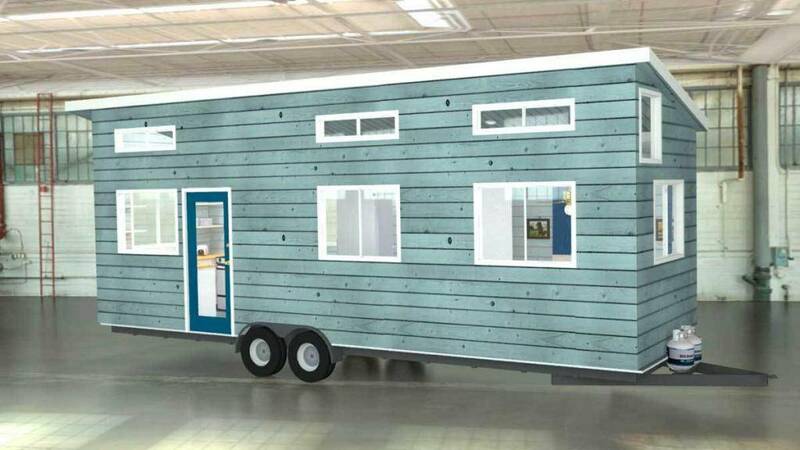 For this model presentation and rendering, they've displayed the tiny house in a blue colour scheme, but the colour scheme could be made into any style or colour pallet. It all depends on the aesthetic of the homeowner and the direction they would like to go with their interior decor. With so many opportunities to change the style of the home, the options are endless. All charming tiny house designs have a few things in common. A great exterior finish, a unique interior floor plan and ways to personalize the floor plan so the customer can make it their own. Cheeky Monkey Tiny House builders offer all of that in each of their tiny house designs including this model named Penny. This particular design is one of their smaller designs measuring 20 feet long making it perfect for towing around as a vacation home or cottage. A typical feature of the homes from the Cheeky Monkey collection is that they put the bathroom in the centre of the home which isn't usually done in tiny house design. You can see that by placing the bathroom in the middle of the kitchen and bedroom, it does create an excellent barrier between the areas where food is prepared and where people sleep. With a small house design like this, often the best thing to do with a main floor bedroom is to make the bed into a sofa when it's not being slept on. In this layout, they have the bed placed in the centre of the bedroom space with room to move around it, but the bed could also be pushed up against the wall to be used as a large sofa during the day. There are also great multifunctional furniture options like sofa beds and futons that work great in a space like this one. 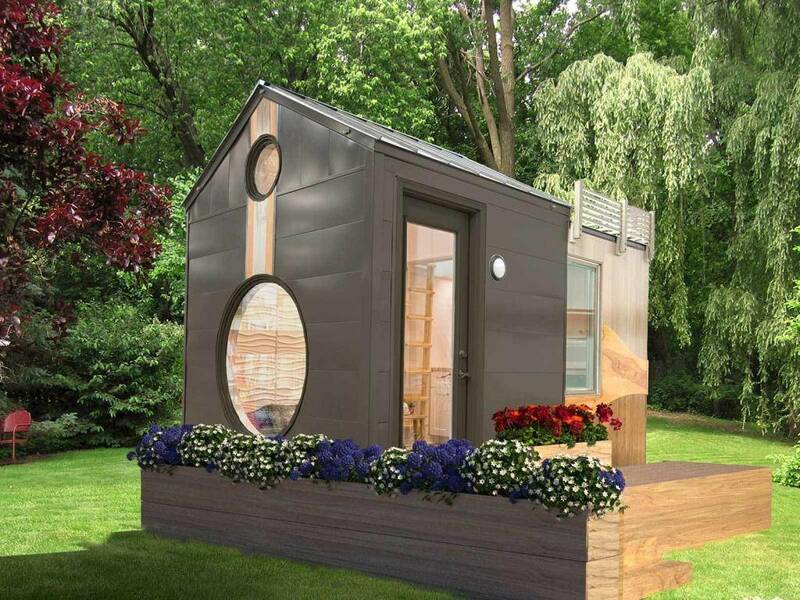 For a design that is both compact and versatile, Penny is a beautiful small house option. A stylish tiny house with lots of clever features hidden away inside, the Ibiza tiny house design is packed full of style and practicality making it the perfect tiny house for full-time living or to use as a vacation home or cabin. 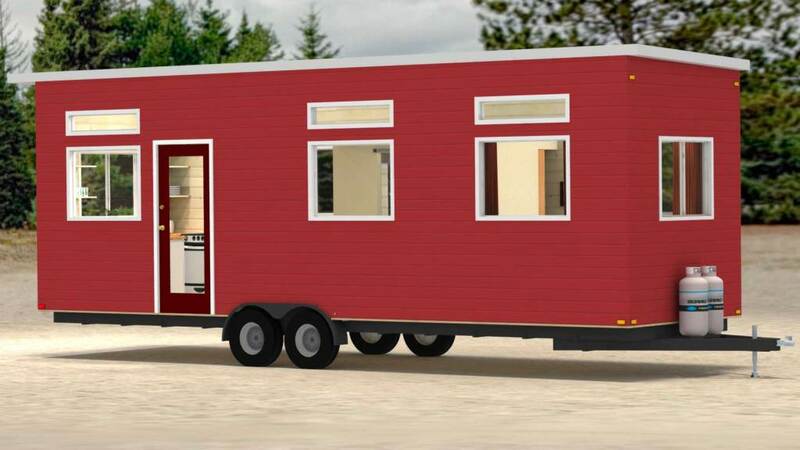 The home measures 20 feet long by 8.6 feet wide making it very portable and versatile. The exterior is covered in natural wood creating a warm, welcoming vibe for the house, and the glass door offers you a sneak peek into the home before you enter in. Once inside, there is so much to appreciate about this small house design. From the gorgeous deep brown hardwood flooring to the wood-lined walls and ceiling and everything in between. While sometimes mixing different types and colours of wood may not work, the mix of light and dark coloured wood seems to work beautifully in this space. They create a beautiful juxtaposition playing off of each other to create harmony and balance in the home design. In a tiny house, it's essential to have this contrast of light and dark to add depth and space to the smaller living quarters. You'll also notice tons of great storage in the tiny house including the bench storage seating in the living room, as well as the storage staircase leading up to the sleeping loft. Each of these little additions makes the world of difference in a smaller space like this, making it more liveable for the inhabitants. 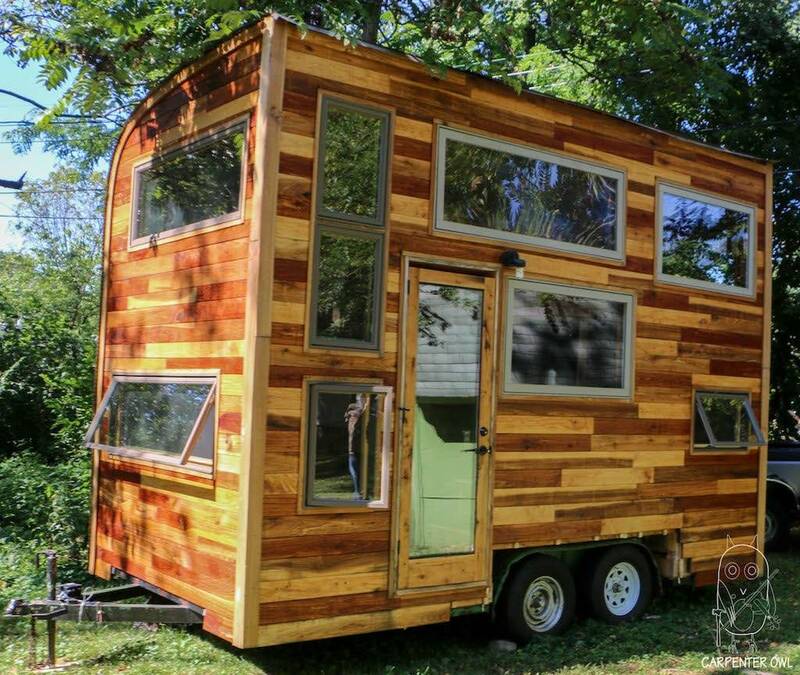 Is this a style of tiny house you could see yourself living in? Bet you never dreamed of a whole family being able to live in a tiny house on wheels before. It turns out the Cayman tiny house on wheels was built for the whole family, a family of four to be exact. A couple and their two young boys live in the 34-foot long tiny house that was custom built for them on a triple axle trailer. The design of the home is much larger than most tiny houses on wheels, but when it needs to accommodate a family of four, it needs to be that large. The home features a loft for the kids to sleep in that they share as well as the master bedroom which is on the main level of the home. They accommodated the bed in the master bedroom by installing a Murphy bed with storage and a desk under it. It's smart furniture ideas like this that save the day when it comes to designing a tiny house. The living room is at the heart of the home with the kitchen nearby. Like most family kitchens, this one is equipped with all of the major appliances needed to run a household smoothly, and there's also a large farmhouse sink included as well. Across from the fridge, they even installed a laundry unit which is very useful in any home, especially one with kids. So if you have children and dream of living in a tiny house on wheels, just know it's very possible and very practical for your family as long as you get the perfect floor plan. The fresh and modern Catalina tiny house is one you'll remember. The designers and builders from Tiny Innovations packed so much into this tiny house on wheels that it could feel like a trendy studio apartment in the city. Since it's on wheels, it can be taken anywhere which adds to the value of this small abode. The exterior features beautiful wood siding and some white board and batten siding for a bright and modern appeal. The home also features a shed roof which makes way for higher ceilings on the inside and a very modern look on the outside. The builders even included a nice storage bench on the outside of the tiny house set on the hitch of the trailer near the home. Having additional storage like this is key for mechanical items and outdoor gear. The interior is also clad with cedar tongue and groove like the exterior, and they also installed wood flooring and butcher block countertops. Having the white accents on the inside of the home is an excellent continuation of the exterior colour pallet, and it also creates a light and airy feel within the house. One of the coolest features might be the large stainless steel basin sink that offers tons of space to do dishes. Plus, all of the appliances are also stainless steel and full sized. Also included in the home is an all in one washer and dryer combo unit making laundry a breeze. This epic design shows you don't have so skrimp when it comes to your finishings and appliances in a tiny house and that there's always a balance that can be achieved. This is a Build to Suit: We have 13 wooded lots in Granbury, Texas and gearing up to build some small luxury homes including, Texas Tiny Homes Plan 630. This home is ideal for weekend get-a-ways, or full time residency for a single person, or a couple wanting to live the simple/good life. The rustic 2-story mountain style luxury home plan has everything you need to live comfortably, as well as economically. The small luxury home has a full staircase leading up to the master suite, which features a full bathroom, a good size wardrobe closet and a built in dresser. For more information on Plan 630 and our Granbury lots go to our website. 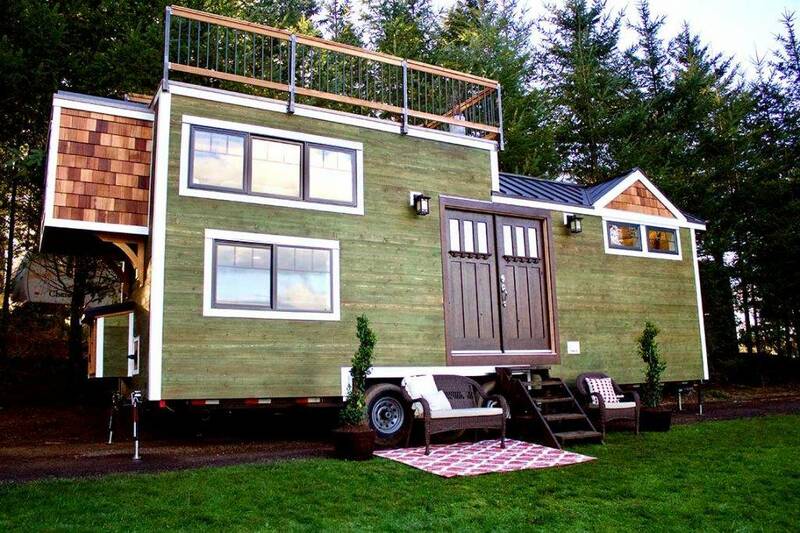 Who knew a tiny house on wheels could have not one but two entrances as well as an attached porch on the front. While most tiny houses have decks built onto them once they're parked, this one can take it's little porch with it wherever it goes. On the outside, the tiny house looks classic and traditional, and this carries through to the inside of the home which has a modern farmhouse style of design to it. Inside, the home even features skylights which bring so much added light into the home brightening it up and making it feel more substantial. The white paint on the tongue and groove walls also helps with this as well as the white cabinetry included in the kitchen. Warm hardwood floors create a sense of depth and coziness, and the Dickenson propane heater is sure also to provide some warmth to the home as well. When you don't have a lot of horizontal space, vertical space becomes the perfect place for storage which is showcased beautifully in this tiny house design with the shelving they've included. The industrial farmhouse look is carried on with the handmade kitchen table and bench seating made out of metal piping and solid wood, and the barn door to the bathroom is also a nice touch as well. The toilet may seem a little out of the ordinary, but that's just because it's a composting toilet that can be used anywhere and won't need to be hooked up to sewage. There's so much to love about this tiny house design and even more to explore with all of the hidden features and great design choices. What's not to love about a sun filled home with a cheery feel to it? The Emerald model from Tiny Heirloom has both of these essential features thanks to all of the windows and skylights included in the design. You will also notice the luxurious granite countertops in the kitchen and the stainless steel appliances that are all full-sized. This is a kitchen created for people who love to cook. This tiny house also features a separate area for the living room which can be closed off from the rest of the house. This would be perfect for those who work from home and need a home office with a door for privacy and quiet. The mini hallway connecting the kitchen and dining area to the living room area also provides a lot of great storage too which is always beneficial. The bedroom is in the loft above the living room, and there is a skylight up there to create more head space and to allow natural light into the space. All of the details from the warm wood floors to the shelving on the walls makes this tiny house very functional and practical for daily life, and it could be wonderful for a couple or a small family to live in full-time or to use as a vacation home. One of the other perks of the tiny house design is the built-in porch on the home, so there is no need to build a porch from scratch every time it's moved around. Not many tiny house designs can make dark colours work the way that it works in this small house design. Most design tips tell us to stay away from darker shades if we're decorating a small space, but this design embraces the dark colours in a very attractive way. While using a lighter colour pallet has its benefits, we can also see that when black and other dark tones are used in the right way, they can create depth in a tiny home interior which can also make it appear larger. This tiny house design makes use of black for the trim, flooring and some of the feature walls in the home, picking and choosing the right places to put it makes all the difference. They went with white cabinets and walls which creates the perfect balance between dark and light making for the perfect yin and yang decor motif. One of the other notable features of this tiny house on wheels is the awesome rooftop patio with a railing for safety. This would be the perfect place to watch the sunset or catch some fireworks nearby. Another great exterior feature is the storage box on the hitch of the trailer because we all know how vital storage is for smaller spaces. Nestled amongst the trees is the perfect place for this modern rustic tiny house which would make a happy full-time or part-time home. The Modern tiny home is a great reminder not to leave out darker colours when decorating and designing your tiny home, and how to use them in the best way. Bringing a little bit of the past into the present works perfectly in this stylish tiny house design. The Midcentury Modern tiny house showcases a style of design that gained popularity in the early 60s. The design style features clean lines and wood finishes with a minimalist flair. While the tiny house design isn't completely midcentury modern, it does have some elements of the style with rustic and contemporary pieces added in. There are even some industrial aspects to the design including all of the metal and the subway tile. The home also features a beautiful slab of live edge wood for an element of nature too. Some of the modern additions include the glass fireplace with a very minimalist profile and the bathroom sink which is the perfect size for a small bathroom. Hidden away at the top of the storage staircase, is the loft bedroom. The bedroom is very cozy and private with plenty of headspace thanks to the flat ceiling. They were also sure to include two large opening windows on either side of the bed for excellent ventilation and a feeling of spaciousness. Another feature everyone will love is the large skylight in the kitchen area that allows light to pour into the home. There is also ample seating within this tiny house with a dining set, a bench seat and bar table as well as a cozy sofa bed nook. The open floor plan helps to make the space feel larger than it is while also making it more functional and efficient. One of the many reasons people love tiny houses on wheels so much is the liberty and freedom to create a totally unique design. That is certainly the case with the Tiny Adventure home that was custom built for a couple who loves outdoor adventure. This home is full of awesome surprises and features. The main feature of the home is the most obvious since it covers the entire side of the home. This feature would be the rock climbing wall that extends the length of one of the exterior walls of the tiny house on wheels. The builders created this rock climbing wall as a fun way to showcase the client's personal interests and give them a space to practice their passions. The next incredible feature is the glass garage door that creates a grand entrance into the home while opening it up to the outdoors. Inside, the home is filled with colour and even more wonderful features. The kitchen looks like the perfect place to cook meals and when all is said and done the large stainless steel sink makes clean up easy. Then, in the bathroom is a very deep tub that would be desirable to any homeowner and would be perfect for soothing aching muscles after a day of adventuring and outdoor activity. On the main level, there is also bench seating around a table that's large enough to fit six or seven people comfortably to dine or play board games. The sky is the limit when it comes to tiny house design, and the Adventure home is just proof of that. Cozy, comfortable and welcoming are all feelings you'll get when you take a look at this tiny house on wheels. This tiny house was created for a family with two young children which shows that it's very possible to live in a tiny house as a small family. You may be wondering where the kids sleep, look no further than the second loft space that is divided in two by a partition down the middle. Each side has its own mattress, and one side has a skylight while both sides have opening windows. The partition is made up of small shelves and nooks where the kids can store their items like books and their favourite toys. Plus, they have light switches right nearby so they can turn their lights on and off as needed. The master loft is for mom and dad to sleep in, but it's very similar to the kid's loft with two opening windows and a skylight on one side. They also have a small window at the head of the bed for even more ventilation and views. Both of the lofts are reached by a staircase of their own, and each staircase includes storage within. One of them holds the all in one washer and dryer combo unit which is especially important when you have a family to keep up with. Lots of counter space in the kitchen makes for easy meal prep, and the large sink would be perfect for clean up. There's also a nicely appointed dest space for work at home and a very stylish bathroom. No home is too small for a family to live happily, and the Rocky Mountain Home is just proof of that. Now here's a tiny house with a funky design. You need to have a look at the High-Flying Tiny Home built for Lisette, a flight attendant who wanted to get out of the rental game. 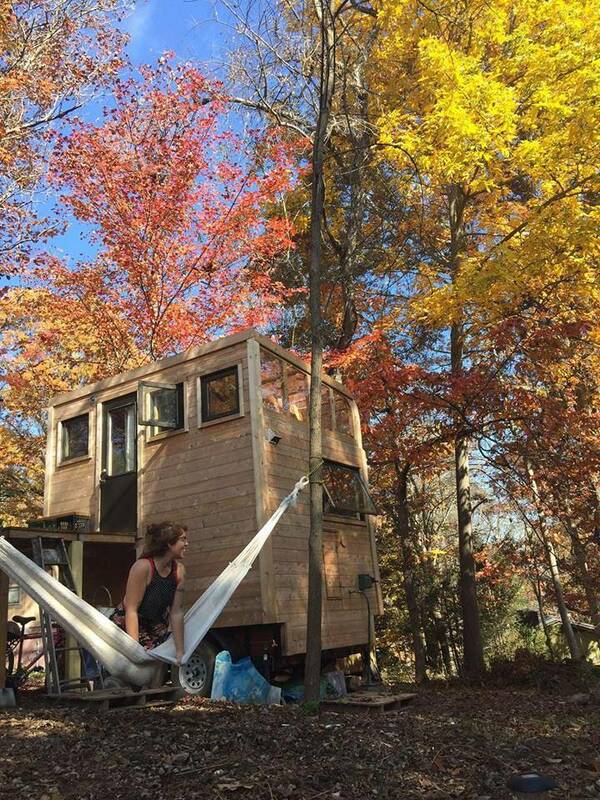 So instead of having to share her living space with roommates, she opted to have a tiny house built for her. 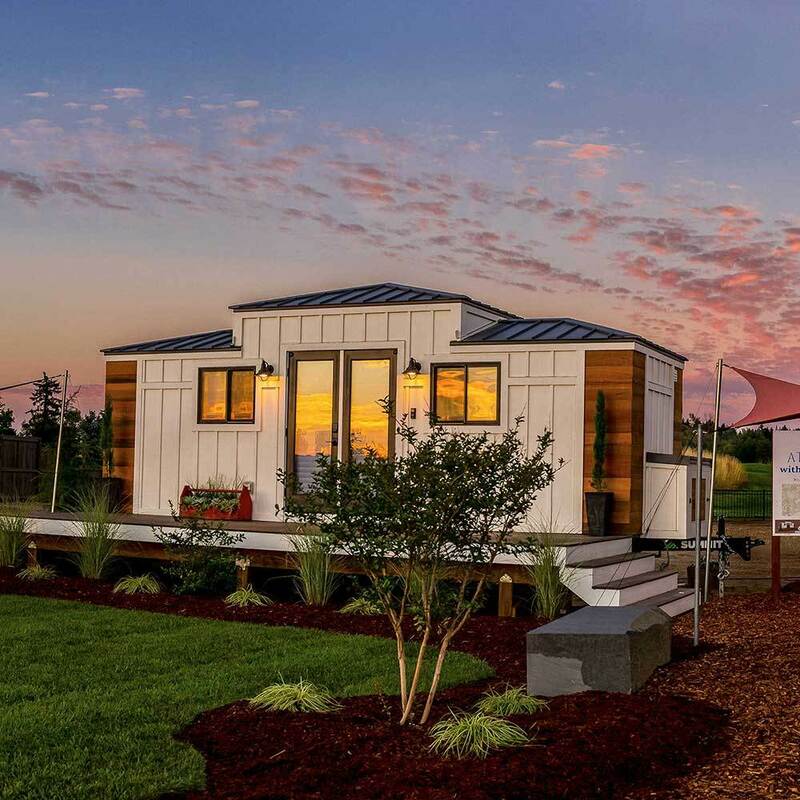 The tiny house build was featured on HGTV's Tiny Luxury, and it's seriously one of a kind. The exterior shows off the home's uniqueness right away with the rounded windows and the mod front entrance. The rounded windows are also a nod to Lisette's career as a flight attendant and the small windows that you can peer out of as you're flying through the air. There is also a large round window at the head of her bed in addition to the smaller round windows which adds to the mod style of the home. The kitchen includes everything she needs to make her meals when she's home. There is a full-sized stainless steel stove, a huge stainless steel sink, and an apartment sized fridge. Besides the main sleeping loft, she also has another loft with a smaller bed in it that can be used for lounging or for an overnight guest. There are stairs leading up to the main loft and a ladder for the second loft. The handmade bench sofa is just the right size for the living room area, and it looks like it could even fold out to be a bed. All of these incredible features makes this the perfect place for a flight attendant to land when she's not in the air. From the outside, this tiny house on wheels may look like a quaint cabin in the woods, but there is so much more to explore on the inside. Through the wooden double doors, you'll find that this tiny house design is sweet and simple, but it's also got a sophisticated edge to it too. With all of the high-end finishes and neutral colour palette with pops of colour here and there, this tiny house has a lot of class. In the bedroom loft, there is an excellent skylight plus windows on either side, and an innovative staircase to climb up to it. The handcrafted wooden staircase comes apart to create the stair to reach the loft, and when it's not in use, it tucks away. The second loft is just as impressive as the main loft, with a cute little seating area complete with a TV, telescope and windows, as well as a ladder leading up to the rooftop patio. That would be the perfect place to put that telescope to good use. The kitchen is a dream come true even for those who aren't interested in small house living. The granite countertops shimmer in the light and the deep double sink is perfect for dish duty. The builders were also sure to include luxury appliances and a combination washer and dryer for convenience. Past the kitchen, you catch a glimpse of the bathroom with the full-sized soaker tub which is beyond what most tiny homes have in them. The window above the bathtub is also wonderful and adds so much character to the home. Who says tiny houses need to be basic? This home shows us that you can take your style and run with it in a tiny house on wheels, even with limited space. 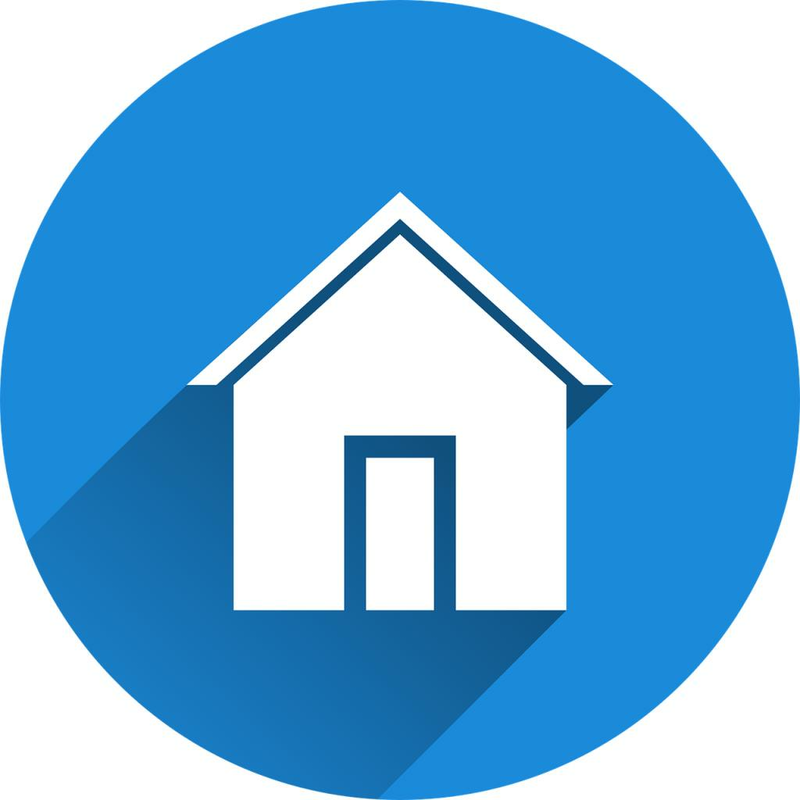 Tiny house listings, buy and sell tiny houses.